Gene M. Amdahl, chief architect of IBM's System/360 mainframe and later the creator of the IBM plug-compatible mainframe vendor that bore his name, has died aged 92. Amdahl was born in South Dakota, earning a bachelor's degree in engineering physics at the state university in 1948. In 1950, as a PhD student at the University of Wisconsin-Madison, he and Charles H. Davidson designed a digital computer. In 1952, the year Amdahl received his doctorate in theoretical physics, the university began building the computer, the Wisconsin Integrally Synchronized Computer (WISC). 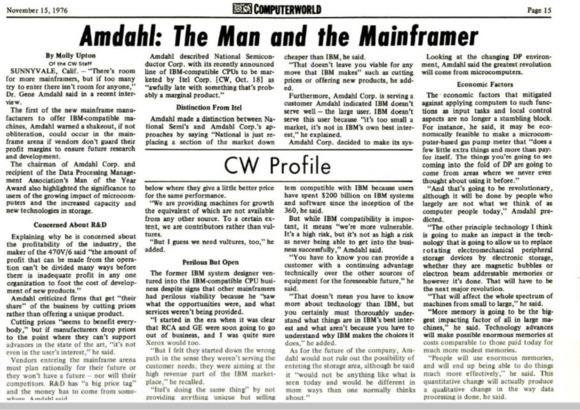 However, Amdahl didn't stick around: In June that year, he joined IBM, where the company credits him with working on the IBM 704, the IBM 709, and then the Stretch project, which ultimately became the IBM 7030. In 1955 he left IBM to work on innovations in radar and data processing, according to his alma mater. He returned to IBM in 1960 as the manager of architecture for the System/360 mainframe -- an architecture that lives on today in the company's System Z servers, which can still run System/360 applications. When he left IBM for the second time, in 1970, it was to found his own mainframe company, Amdahl Corp., designing machines that were faster and cheaper yet still plug-compatible with those of IBM. Fujitsu was an early investor, and built the company's first commercial product, the Amdahl 470V/6, at its factory in Kawasaki, Japan. It eventually bought the whole company, finally pulling out of the plug-compatible market in 2000 following IBM's launch of 64-bit systems. Amdahl himself had moved on to other things in 1979. According to the Association of Computing Machinery, he first set up a chip company, Trilogy Systems, where for ten years he worked on chips that he hoped would further lower the cost of mainframes. Another venture he founded, Andor International, struggled in the mid-size mainframe market, filing for bankruptcy in 1995. His name will live on, to the frustration of many students of the science of parallel computing, in Amdahl's Law, which tells them that no matter how many processor cores they throw at a problem, there are some things they just can't speed up. "The effort expended on achieving high parallel processing rates is wasted unless it is accompanied by achievements in sequential processing rates of very nearly the same magnitude," he wrote in a 1967 academic paper, "Validity of the single processor approach to achieving large scale computing capabilities." Amdahl was something of a futurist. In an interview with Computerworld published Nov. 15, 1976, he predicted the coming of smart devices and the Internet of Things; the death of disks, and the use of in-memory databases. On smart gas pump metering, he said it may be economically feasible to make a microcomputer-based meter that "does a few little extra things and more than pays for itself. The things you're going to see coming into the fold of data-processing are going to come from areas where we never even thought about using it before. And that's going to be revolutionary, although it will be done by people who largely are not what we think of as computer people today," he told Computerworld reporter Molly Upton. Hard disks have lasted years longer than Amdahl expected, although the electronic storage alternatives he foresaw sound way less practical than the flash memory that is ubiquitous today: "The other principle technology I think is going to make an impact is the technology that is going to allow us to replace rotating electromechanical peripheral storage devices by electronic storage, whether they are magnetic bubbles or electron beam addressable memories or however it's done." As for in-memory databases: "More memory is going to be the biggest impacting factor of all in large machines. People will use enormous memories and will end up being able to do things much more effectively," he said. The Amdahl 470V/6 introduced the previous year could hold up to 8MB of memory: Today's in-memory databases run on machines with a million times more.